Magic, friendship and adventure sparkle in Melanie Abed’s richly imagined world of humans and the supernatural Elementals, and the myths and mysteries that bind them. Anni Moon and Lexi Waterstone are students at Waterstone Academy for Girls in Chicago. Orphans, the girls are as close as sisters, but Lexi has a secret: Lexi is related to the founding family of the school—a family that, unbeknownst to humans like Anni, is of Elemental origin. Elementals are beings with supernatural powers connected to the elements of water, earth, wood, and fire. Anni knows nothing of the existence of Elementals, much less that her best friend is one. Anni discovers the startling truth when Lexi is kidnapped and, in response, Anni’s guardian ships her off to Moon Zephyr, an Elemental world floating unseen above London. Desperate to save her best friend, Anni must rely on the ingenuity and talents of strangers, and must trust herself in a completely unfamiliar world wrought with danger and mind-boggling power. Abed has created a lavish fantasy filled with enchantment and intrigue and abounding with charm. Clearly inspired by notable fantasy classics, most obviously the Harry Potter series, Anni Moon is a delightful foray into a richly imagined world and features an alluring cast of characters with evocative names, such as Ms. Downsnout, Headmistress Turnkey, and Miss Sugar. Densely layered, the plot can read like a summary at times, but this issue is quickly forgotten as Anni travels deeper into the colorful world of Elementals. The book is also enriched by the beautifully rendered illustrations, which were created by the author’s husband. This girl-power story of friendship, devotion, and self-discovery is as empowering as it is entertaining. 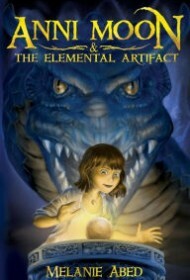 Anni Moon and the Elemental Artifact is an extraordinary opening act in a promising series. Highly recommended for fans of: the Harry Potter series, Savvy by Ingrid Law, and The Spiderwick Chronicles.